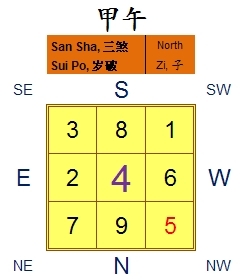 On February the 4th 2014, we will enter the solar calendar of the year Jia Wu (甲午) or Wood Horse. This day is also known as Li Chun 立春 is an important date for Chinese metaphysics practitioners if you follow the Xia (Hsia) Calendar. It impact us in many ways. One of it is our House Feng Shui and the other our Destiny. To some it will bring challenges while others new growth and opportunities. This year San Sha 三殺 or 3 Killings goes to the North. The 5 Yellow or 5 Wang flies to the North West Sector. You may hang a Copper Bell in this Sector to reduce the bad effects of 5 Yellow. The Year breaker or Sui Po 岁破 goes to Rat sector since Tai Sui is at the Horse sector. Good Sectors would be namely South, South West, West and North. They will be good for wealth in general but Star 9 can also spell problems. Bad Sectors would be namely North West, North East and East. They will bring sickness, gossips and loss of wealth. Prediction: Generally, this year is exceptionally well for South Facing Period 8 Houses. Plan ahead, work it out and things will turn in your favour. Having open houses will invite good fortune. How ever, South Facing Houses, SE & NW Facing Houses too are not allow renovation in general. The other houses, you will have to interpret together with your house natal chart and the Quarterly Chart to have a fuller picture. East Facing Houses, use the South West, West door or South door will be auspicious. South Facing Houses, South, North, South West or West Doors are good. North Facing House, North, South, South West or West Doors are good. West Facing Houses, South West and West doors are good. North West Facing Houses, generally, South East & South West is usable. North East Facing Houses, South & South West door are good while South East and West is usable. South East Facing Houses, South West & South East doors are good. South West Facing Houses, South & North doors are good. This you will have to see how the Jia Wu (甲午) reacts to your Bazi. In General, this is a good year for Jia, Yi, Geng, Ji and Ding Day Masters. However, likely Jia year brings challenges to Wu and to some extent Xin, Ren Day Masters. 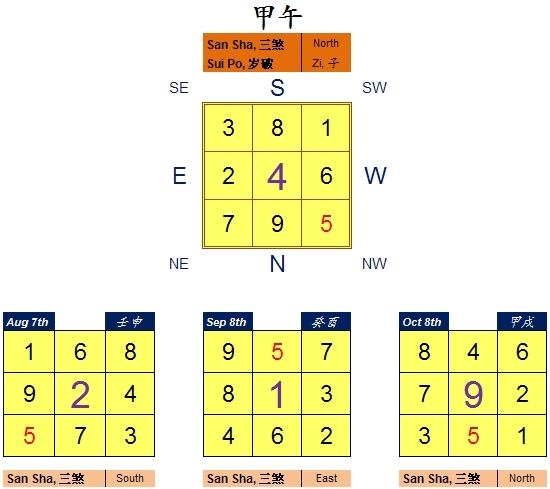 General outlook based on Jia Wu pillar is favourable for countries located on the East and South of the Globe. To know more, you will need a Bazi Consultation since each Bazi is unique to the situation. It is not possible to generalize since the accuracy will be compromised. Good Chi to you always!! !